Florian Kamberi fires well over the bar but referee Steven McLean brings play back for a free-kick for Michael Devlin’s challenge on Emerson Hyndman. Devlin gets booked but Hibs cannot make anything out of the set piece. Now Hibs threaten and Emerson Hyndman tests Joe Lewis with a shot. Aberdeen win a free-kick in a dangerous area and Dominic Ball’s effort cannons off the crossbar and bounces down in the six-yard box. 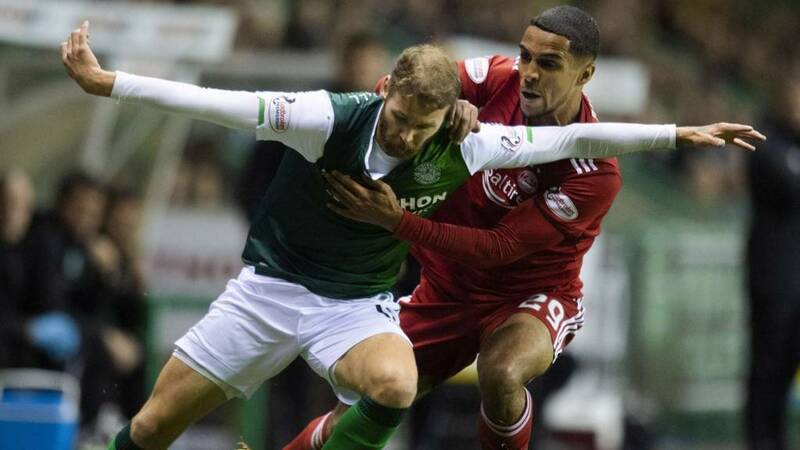 Hibs get it clear and they will feel that’s a real let off. both teams passing up decent opportunities in the opening quarter of the game. McLean has witnessed and no doubt taken note of. Stevie Mallan’s free-kick is too high and dips over the Aberdeen crossbar. Gary Mackay-Steven flashes a shot wide of the Hibernian goal following another Aberdeen set piece. Emerson Hyndman gets into an advanced position for Hibernian but the challenge of Michael Devlin puts the midfielder off and his shot goes wide. Referee Steven McLean has a word with Hibs’ Florian Kamberi and Aberdeen’s Scott McKenna after the pair tussle off the ball but no cards. An open game so far but both sides are struggling to retain possession. A few misplaced passes here and there are preventing any real flow to the play. Aberdeen were bossing things but Hibernian mount a piercing counter attack with Florian Kamberi played in by Emerson Hyndman. Kamberi manages to get away from the Aberdeen defence and goalkeeper Joe Lewis but, on the turn, the striker knocks the ball wide. Scotland manager Alex McLeish is among the spectators this evening. McLeish is no stranger to these two clubs having played most of his career at Aberdeen and winning promotion as Hibs manager. Gary Mackay-Steven has another set piece opportunity on the opposite side of the pitch, the right, but his delivery is far too high. Hibs goalkeeper Adam Bogdan denies Andy Considine from close range following a free-kick from Gary Mackay-Steven. Hibs still have a bit of work to do and Mark Milligan makes a vital clearance. And it’s Hibs who kick off.